So small and yet a notebook. Be careful when you lift the Vaio X. It is so unexpectedly light that it might just fly out of your hand. That would be shame as the 11.1 Inch-subnotebook with Intel's Atom CPU is well designed. Find out in our detailed test if there are more reasons to take good care of Sony's subnotebook. The letter X has become established in the portfolio of many manufacturers as a symbol for thin and lightweight subnotebooks. Also Sony's Vaio VPC-X11S1E fits in that category: Just 1.4 centimeters in height and 760 grams of weight make the tiny notebook an ultraportable device and let it fit in almost any pocket. 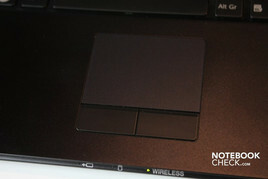 To still be able to offer some performance, Sony incorporates an Atom-CPU and an SSD-harddrive. 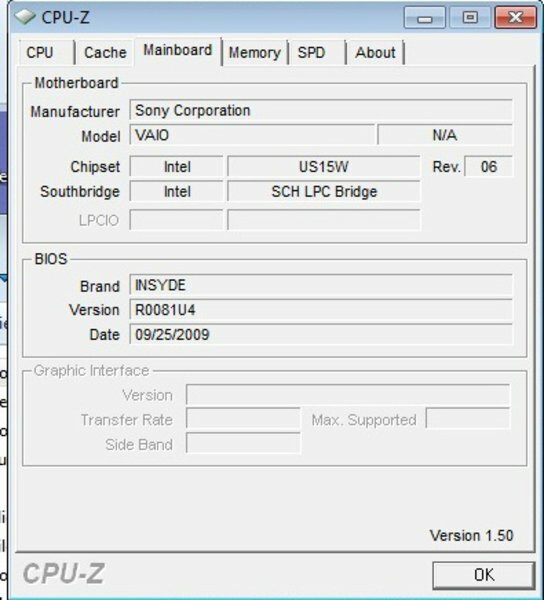 Our test sample came with an Atom Z540 at 1,86 GHz, an Intel Graphics Media Accelerator 500 and a 128 GByte-SSD manufactured by Samsung. The price for this configuration was quite expensive: 1499 euros. To allow the light and thin design of the Vaio X Sony uses a combination of different materials: The bottom part and the display lid are made of carbon fibre. The wrist-rest is made of aluminium and is unfortunately rather quickly covered in fingerprints. In our sample the lid didn't protect the screen very well from pressure: Its effect was soon and very largely visible on the screen. 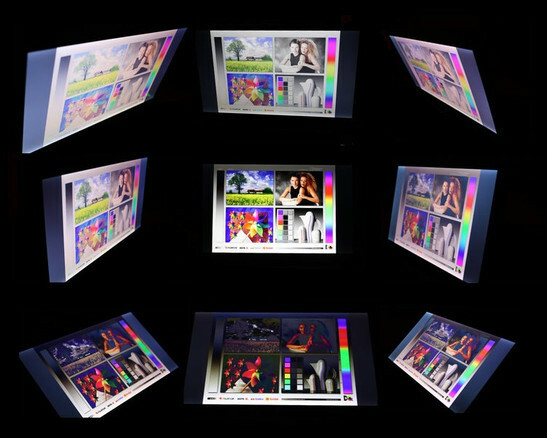 The screen, at just 4 millimeters, can also be easily bent, which results in color distortions. The rest of the case feels quite solid, it cannot be bent and also stays in form when the user lifts up his notebook on one corner. The monitor's hinges look quite broad when compared to the overall size of the notebook and keep the monitor stable after just a short tettering. Although the monitor opens smoothly, the hinges are nevertheless so firmly adjusted that the display doesn't need any further closing-mechanism. Our test sample is colored completely in black. If you want something a little more extravagant you might select a golden finish in Sony's own Sonystyle shop. In all other aspects, Sony's design is quite classic: Rounded corners, a silver Vaio logo and a milled stripe across the display lid are the only details that Sony grants the otherwise simple case. On the bottom there are the battery and, beneath it, a SIM-card-slot for mobile internet. On the front two card-readers can be found below the status-LEDs, one for SD-cards, the other for the Memory-Stick-family. Sony put a headphone jack, two USB 2.0-ports, a Kensington-Lock and, behind it, the DC-in on the left side. On the right only two ports are located: A LAN-port and the VGA-port. Because the LAN port being too high for the thin chassis, Sony uses a foldable LAN-port: The lower part of the plug has to be opened before the connector fits into the plug. Left: headphone-out, 2xUSB, Kensington Lock, DC-in. Although this port is cleverly constructed most users will, anyway, prefer WLAN. Sony uses Intel's WiFiLink 4965AGN card, which supports the standards 802.11 a,g, and draft-n. The card allows data rates of up to 300 MBit per second – also users with high speed DSL-access should be satisfied. Furthermore Sony includes Bluetooth standard 2.1 including Enhanced Data Rate as well as a WWAN card for mobile internet and support for HSDPA, HSUPA, UMTS, GPRS, and EDGE. Besides a micro fibre cloth for the wrist-rest and the monitor Sony includes a recovery-DVD, so users can recover the installed operating system Windows 7 Professional even if there are problems like a defective SSD. At Sony's homepage users can buy a lithium ion battery with 8200 milliampere hours, which doubles the battery runtime. Of course this battery needs more space and a part of it protrudes from the back of the Vaio X. Sony charges 229 euros for it while the standard battery only costs 129 euros. A special leather sleeve for the Vaio X is 99 euros, a bluetooth mouse with matching design costs 69 euros. There was a test version of the McAfee Security Center preinstalled as well as Microsoft's Office 60 days trial and Norton Online Backup, which is also limited. Besides that Sony includes only a few full versions as give-aways: Vaio Photo- and Videosuite, MusicStation and EverywAir, which helps you in setting up your wireless internet. Due to the missing DVD drive there is also no DVD player software included. By installing hardly any software on the system, the operating system is kept light. In contrary, we criticized other Sony systems for being excessively and ineffectively equipped with software. On the other hand Sony could have included at least one full version that brings a real advantage. MusicStation and Photo- and Videosuite are nice give-aways yet their functionality is already included in Windows through Media Player and Photo Gallery. 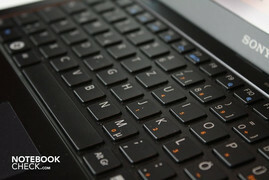 For some time almost all Sony laptops come with a so called chiclet keyboard. That helps to tell the keys apart while writing and also looks stylish. Of course you cannot expect a full-size keyboard in an 11.1 inch machine but Sony's X series nevertheless possesses a suitable typing device. You have to get used to typing due to the relatively hard key stroke but all keys are sufficiently sized and are located where you would expect them. The Page Up- and Page Down-keys as well as the Home and End key are only accessible through a combination with the “Fn”-key. In exchange there is a second “Fn”-key located next to the arrow keys, so, that one can also activate it with the right hand. Volume and brightness are also controlled through combinations between the “Fn”-key and the “F”-keys as well as switching to an external monitor. Above the keyboard sits the Wireless switch, known from other Sony devices. It switches LAN, WLAN, and WWAN on and off. The touchpad sits in the middle of the wrist-rest and is separated optically and hapticly by a small sill. The touch sensitive surface is quite small especially as there is a scroll bar on the right and the lower side that is not detached from the rest. During our test however, the scroll bar was never activated by accident but rather just when you lift your finger and lower it again on the very right or lower part of the touchpad. Sony does not follow the trend to include Multi-Touch gestures with its current X-series: The touchpad did not react to the input of two fingers at the same time. The two buttons located underneath the touchpad are also a bit small yet they operate well and give good feedback on the keystroke. 11.1 inch is the size of the Sony Vaio VPC-X11S1E's LED backlighted display. The resolution is 1366 x 768 pixels, which is no problem thanks to the scalability of Windows 7. But if you would like to install Windows XP for instance, you have to get used to small symbols and small writing as the DPI value is quite high with 141.2. The screen has its brightest area at the lower middle, where the illumination reaches 275 cd/m². Further to the top of the screen it gets darker, in the upper right corner it offers only 239 cd/m². The overall average is 257.7 cd/m² which is a good value. We didn't exactly like the high black value of the screen: 1.47 cd/m². It results in a rather meager contrast of 177:1. Subjectively that isn't so noticeable, but colors were a bit dull. It's still possible to work in bright light. The screen has a non-glare finish. That in combination with the good brightness makes it possible to work outdoor or in bright light without disturbing reflections. Horizontal and vertical viewing angles describe the angle in which one can sit in front of the screen without the colors changing. The bigger this angle the more you can vary your position in front of the screen. The X11S1E offer good horizontal viewing angles but if you move the screen up or down colors will change quite soon. That is annoying especially because of the mobile layout of the device: When you change the position of the device you might have to also change the inclination of the monitor. 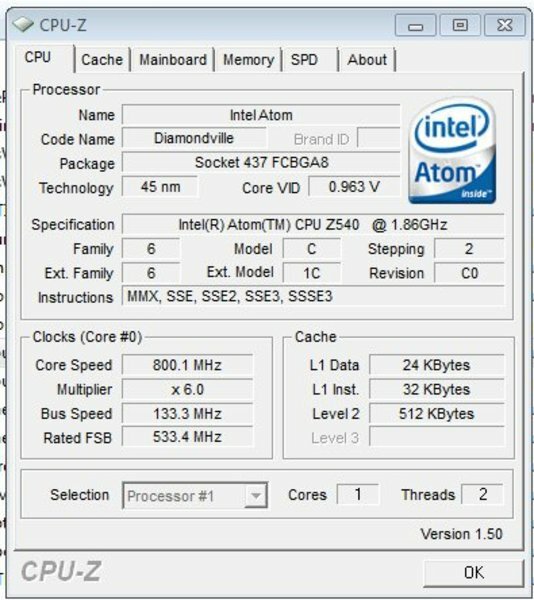 The new Atom CPUs based on the Pinetrail architecture did not yet make it into Sony's X-series. Instead an older Atom Z540 based on the Silverthorne architecture is inside our test sample. The single core processor calculates with 1.86 GHz and has built-in hyperthreading, meaning it can work on two tasks at a time. If you have more money at your disposal, you can also get a Z550 with 2 GHz. 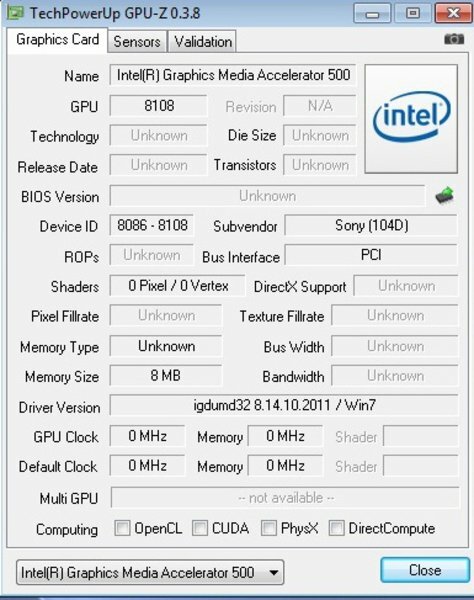 The graphic chip is the Intel Graphics Media Accelerator 500 which is integrated in the chipset. The chip uses up to 760 MByte of the RAM, according to the usage. 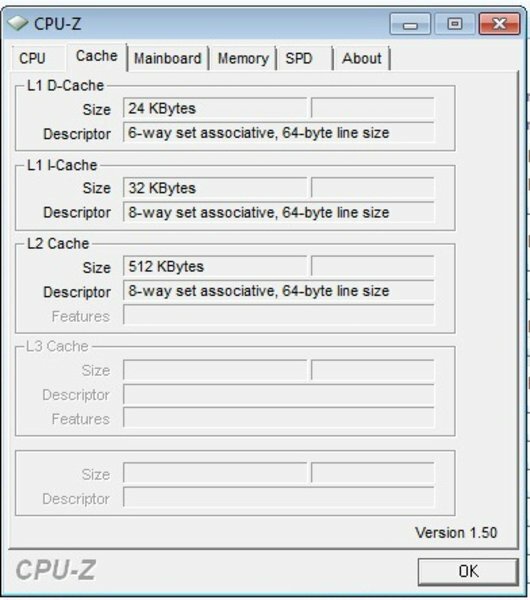 2 GByte DDR2-533 RAM can be used as main memory. The memory consists of one module of 2 GByte and cannot be upgraded as the system only supports a maximum of 2 GByte of memory. Due to the specialization of the notebook in mobility and not on performance you have to cut back on expectations. Despite of browser games you should not try to play any games on the Vaio X: Even in the nine year old benchmark 3DMark2001 the system can only reach 1090 points. In the next version 3DMark03 the system only manages to achieve 370 points. That is too little performance even for the most unambitious gamer. We evaluate the application performance with the tool PCMark05 and get a result of 1547 points. Together with the other tests determining the CPU performance like the benchmarks SuperPi and WPrime we get a rating of 60% for the application performance. That's sufficient for simple tasks like writing texts or surfing the internet, but, as soon as things get a bit more challenging, photo editiing for instance, you should not rely too much on the Vaio X unless you have a lot of patience. To see how the system deals with a video in HD resolution, we downloaded a cinema trailer in Full HD from the internet. Unfortunately the Vaio X was not up to the task: The sound went smoothly, but, the picture was lagging behind even when we plugged in the DC and set the energy saving options to “high performance”. Also high definiton flash videos played from within the browser, for example via gametrailers.com, posed a problem for the Vaio X: They stuttered along. 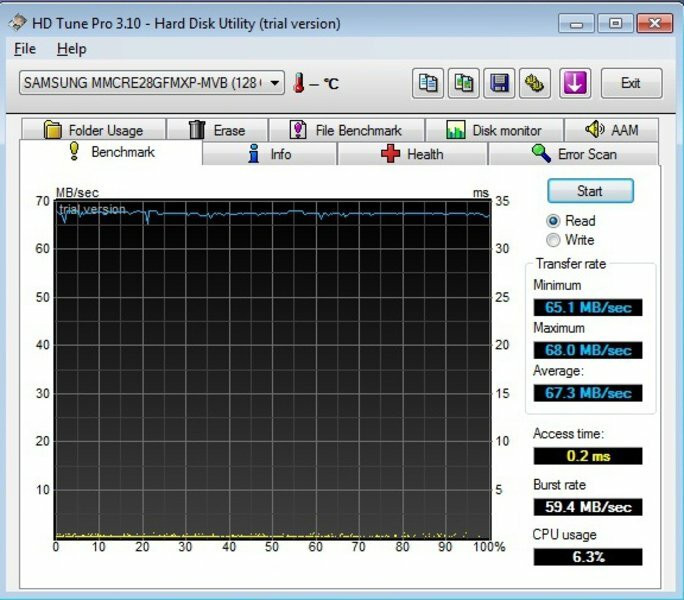 The hard drive in our test sample was a solid state drive by Samsung. The drive has a capacity of 128 GByte. In general, SSDs do not offer a higher data rate than normal hard drives. But, while the data rate stays the same across the whole SSD drive, it falls towards the end of a hard drive. So, the Samsung SSD achieved an average data rate of 67.3 MByte per second and also a considerably lower access time compared to common harddrives: 0.2 milliseconds. Therefore, the Windows Startup should also speed up. We wanted to know it exactly and measured the time necessary to boot the system. The result: After just 37 seconds the Windows desktop comes up, not bad indeed. A look into Windows' own diagnosis system revealed that it took 71 seconds until all programs were loaded. More hard drive capacity turns out to be quite costly, because Sony only offers SSDs for the Vaio X. E.g., upgrading to 256 GBytes costs 390 Euros. However, downgrading to 64 GB only saves 10 euros. With the program DPC Latency Checker we evaluated the system's DPC latencies. 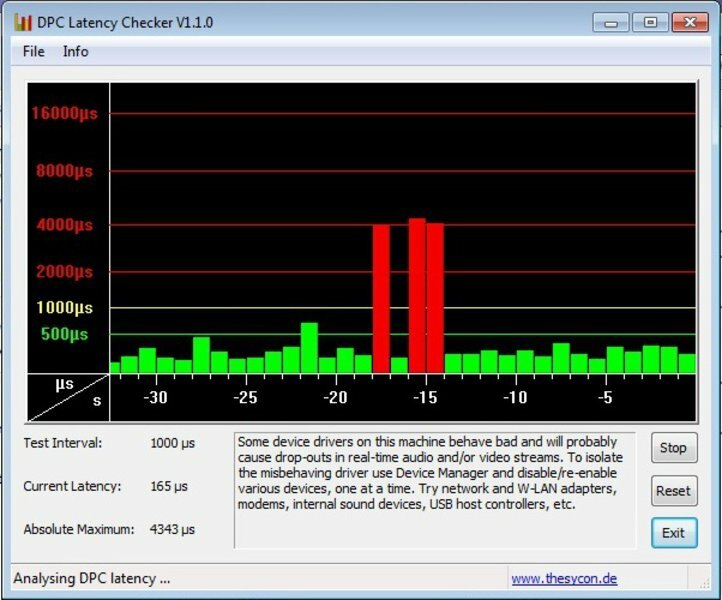 Too long latencies hint on synchronization problems with external devices, e.g., sound crackling of external sound cards, or lagging of graphic cards. Unfortunately the Vaio X11S1E's amplitude went into the red area several times. So, the user should check each driver to find out which one causes the communication delay. The tiny outlet on the back is partly covered by the monitor once the notebook is opened. But, this doesn't seem to impede the fan from doing its job. At least it never gets too loud: We recorded hardly audible 28.3 dB(A) when the system is idle. Furthermore, the fan sits at the rear of the case and emits the already low noise mostly towards the back. Even if maximum performance is needed the small fan just reached a noise of 35.9 dB(A) which is still a very good value. No wonder that our rating for loudness was almost perfect: 95 percent. The only thing impeding a 100 percent rating is the high frequency soundscape of the fan: When a lot of power is needed, an unpleasantly high pitched noise is audible. Despite of the low noise level, the fan does a good job: The system stays well cooled most of the time. The overall maximum temperature is 50.5 degrees Celsius at the left bottom side. But you will have to stress the system as much as it would hardly ever occur during everyday usage of the Vaio X. 50.5 degrees are not perfect but considering the thin case still alright. During idle status, the maximum temperature is 40.6 degrees Celsius in the left upper back part. Thus the laptop gets noticeably warmer, but, can still be put accordingly to its name on the lap. The DC device does not heat up too much with the maximum temperature being 40 degrees. 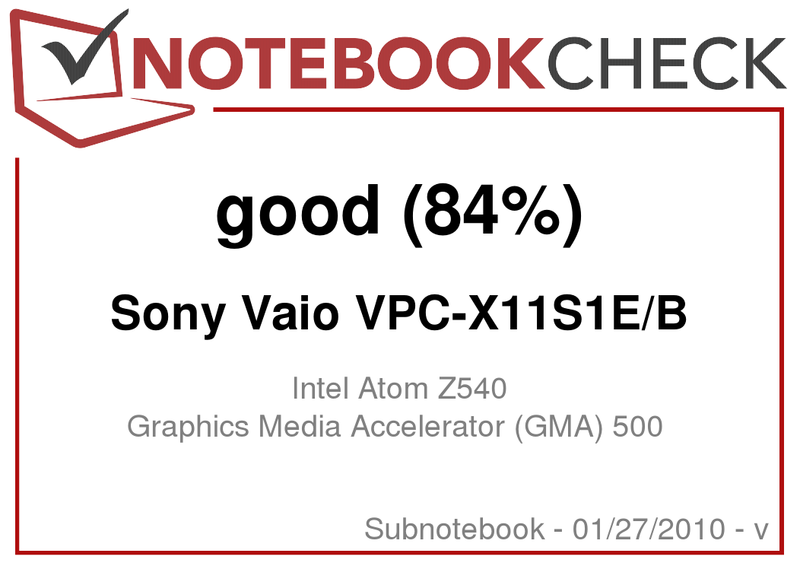 All in all the temperature of Sony's Vaio X11S1E reaches a good rating. (±) The maximum temperature on the upper side is 41.9 °C / 107 F, compared to the average of 35.8 °C / 96 F, ranging from 22 to 57 °C for the class Subnotebook. (+) In idle usage, the average temperature for the upper side is 31.9 °C / 89 F, compared to the device average of 30.7 °C / 87 F.
The small stereo loudspeakers are on the bottom. As they share a single grille, they can hardly create a stereo effect. Furthermore, the desk dampens the soundscape. In addition, neither the maximum volume is very high nor the power of the bass. The speakers will be sufficient for occasional internet videos and Windows sounds but only very unambitious user will be able to enjoy music and movies. But, the headphone jack on the left side is considerably well positioned, at least for right-handers, and also supplies a decent sound. Thus a set of small earphones should be added to the price and weight of the laptop if you really want to enjoy multimedia content. 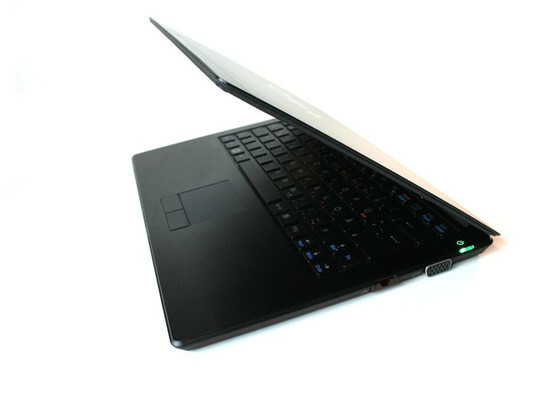 The small 4 cell battery with 33.6 Wh is integrated in the bottom part of the laptop and comes from Sony's own production. It's a lithium ion battery with 33.6 watt hours. A 8 cell battery is also available. According to Sony's marketing it should double the runtime. Even with the standard battery the manufacturer promises up to 8 hours of battery life. We did the reader test in Battery Eater Pro that simulates a minimum load by reading a text. Additionally we switched the energy saver mode on and WLAN off. We got 7 hours and 34 minutes which comes closed to the promised 8 hours. To find out the minimum battery life we also used the Battery Eater tool. This time it calculated a 3D graphic and the energy saving functions were turned off and the screen brightness maximized. The notebook kept running for 170 minutes or 2:50 hours. A good result as well considering that the Vaio X is too weak to use it for such challenging tasks anyway. Most people will use the Vaio X for websurfing via WLAN. On battery we could do so for 312 minutes or 5 hours and 12 minutes. When it comes to power consumption the Vaio X has to be modest to be able to achieve such running times: A minimum consumption of 4.0 watt and a maximum of 11.5 watt under full load really is an excellent value. No wonder Sony can attach the Energy Star Seal on its device. When switched off the Sony laptop only uses 0.1 watt of energy that is within the measuring tolerance to 0.0. In stand-by mode the consumption is 0.3 watt which is still quite passable. Sony and its costumers can be more than content with battery life and power consumption. To bring so much battery power in such a small case really is an achievement. Sony charges quite a lot for its slender device: The extremely stylish computer is offered for 1499 euros and more. Considering you could buy five better equipped notebooks instead, is it really reasonable to go for it? Well it's definitely an experience to have the razor-thin and light as a feather Vaio X in your hands: Suddenly all netbooks in the world seem plump and oversized. Allowedly, the field of application is small: Writing texts, surfing the net, maybe a bit of simplest photo editing, that's it. Still it feels good when other laptop users carry around their huge laptops while you can take this not even 1.4 cm thin notebook out from almost any bag. Furthermore, Sony grants its dwarf a more or less decent display, a battery that is quite strong considering the size of the notebook and a quite timeless design, which you will still like in a few years time. Furthermore, all necessary wireless connections are integrated, but, that's what can be expected in view of the high price. Regarding wired connectivity: There are not plenty of ports, but, that's alright in consideration of the size. The loudspeakers are rather useless when it comes to multimedia, there is no microphone-in, the touchpad is tiny and the fan can become quite noisy: Seems like you will have to live with some flaws when you decide to buy such a thin device. Those who think the Dell Adamo XPS is still too big and do not require the performance of a MacBook Air, should take a look at Sony's designer piece. That is whoever has the necessary petty cash. ...and also small in every other dimension. The SSD harddrive, the thin and timeless design. 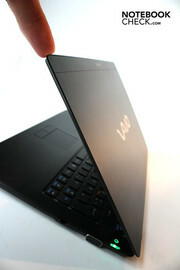 How thin and light the Vaio X is. Comparably thin are only the MacBook Air and the Dell Adamo XPS but both are 13.3 inch laptops. If you look for similar performance and aren't bothered by a bulkier machine you should get a netbook for considerably less money like like the Wind U135 by MSI or the newest Asus EeePC.